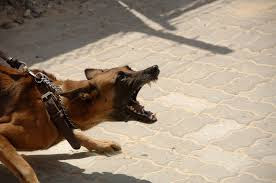 Dog aggression is a general issue confronting a large number of pet owners and can be as a result of a variety of environmental and genetic issues. Dog Aggressive behavior can have a severe consequence and must be treated instantly. This behavior can be a major issue for some individual who simply does not know how to handle the behavior. Aggression is a common problem and can be seen in all dog breeds, although some breeds have the propensity to display this conducts. One of the major key steps in dealing with dog aggression is discovering the cause of aggression. Knowing the reason behind your dog acts of aggressiveness can help you learn the best plan to stop the scary behavior. Here are some of the causes of aggression in dogs: Establishing Dominance: A lot of time dog show aggression in order to establish dominance. This is more frequent towards other dogs; however, it can happen to people too. A dog who shows this kind of aggression feel they control. The biting, growling or snapping happens when they feel that their control is being challenged. Fear: Fear is one of the reasons a dog may display aggression. Usually, a dog only shows aggressive behavior if it feels he is in danger and needs to defend itself. This can happen if he is in a tight corner with no way to escape, or when the dog feels he is under attack. Disease: There are various diseases that make a dog act aggressively. If your dog suddenly displays signs of aggression such as growling, biting or snapping, it can be caused by illness or diseases. Pain is a familiar cause of aggression in dogs. Thyroid diseases, Brain tumors, and rabies are just some of the diseases that can cause the beginning of aggression in dogs. Discuss with your veterinarian to determine if a health problem may be the cause of your dog's aggression. Dog aggressive behavior is a complex issue, but the good news is it can be the remedy or controlled. Here are few ideas: Ensure there is no basic medical condition like a brain tumor, blood sugar or liver disease. Especially if your dog develops aggressive behavior in adulthood that you have never seen before. If possible spay or neuter your dog before he is six months old. An unaltered dog has a higher risk of displaying aggressive behavior. Dogs recognize when a female dog is in heat close-by, and his longing to reproduce can trigger them to begin aggressively with you or other dogs. After the disease has been eliminated, you can begin training your dogs for aggressive training. This will help you in learning more concerning your dog and how to relate better with him.